At galaxy center--or, rather, one system away from center--I came across a Notable Stellar Phenomenon. The monstrous crystals are getting a bit old hat of late. But as I moved deeper into their domain I came across some interesting bright white...sprites, for lack of a better name. As I moved closer to one it woke up and started darting about. It approached my ship and my HUD started getting all wonky. I checked all systems and found nothing damaged. After a few minutes of playing a friendly game of tag with it, I decided to hop in my fighter, giving Francisca the con. As I moved in close to the anomaly, my fighter's HUD also got wonky. But then my shields were collapsing and my hull was taking damage! Fortunately, these sprites aren't nearly as fast or as agile as a fighter, so once I got out of range everything stabilized. I re-docked with the ship, a bit shaky from the experience. I decided to slowly draw the first sprite along with my Anaconda close to a second anomaly. It, too, woke up and started darting about. Once I got too close to both, my HUD went crazy again, but this time my shields were beginning to be affected. No hull damage, though. The conclusion I came to was that just one of these is hazardous to small ships, but it takes more than one to do anything to larger ones. 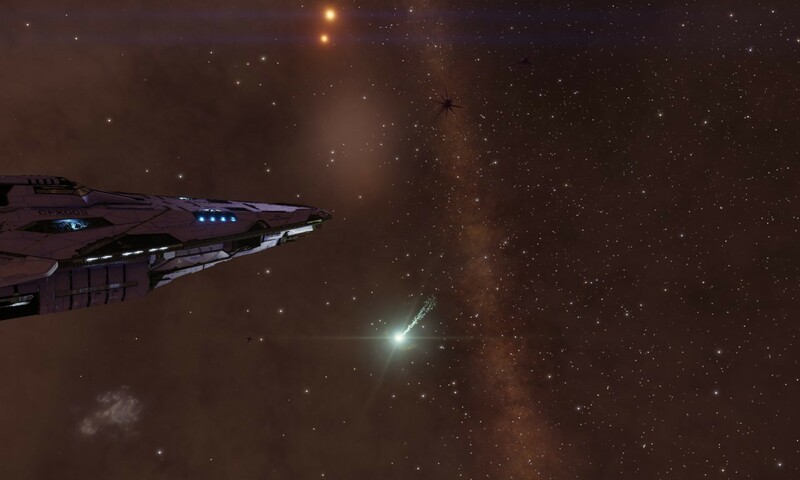 I decided not to experiment with more than two...while I can afford the cost of losing my ship, I'd rather not lose all the cartographic and codex data I've collected this trip. There are only two moons that a ship can set down on in the system, so I picked on and decided to bed down for a few days and really look at the data I recorded from the experience. I still have quite a bit of time before the Distant Worlds 2 fleet makes its way here...at least two more waypoints for them. I hope to have answers to share with their science contingent.